I received my early birthday present from my parents in the mail today. Oh happy mail day! My old phone was on it's very last of 9 lives. Seriously it was like a cat - it was dropped, had cracks on both sides, the lock button didn't work, it would only charge with the computer or car charger but not the wall plug, the battery life was awful but it just kept working (mostly) thankfully. So thankful to have a new pretty phone where all the functions work and it won't die after 3 hours of just sitting in my purse. This girl is going to give me so many gray hairs. Oh my does she has such a strong will. She's entered into the terrible twos early it seems and is fighting to assert her independence. Not only that but she knows what she wants and she will get it. This afternoon I offered her a snack but I had to stop and help Micah with something first. She went ahead to the kitchen, pulled up a chair, found a spoon and helped herself to the cookie butter. I have no idea how she got the lid off or if it just wasn't all the way on. Oh my so many grey hairs. She's a trouble maker for sure. We have t-ball game three tomorrow morning. Micah's hitting improved greatly between games one and two and he had two very solid hits. However his fielding... was a lot more like pouting. Glove on the ground, hat over his face because he didn't to catch the ball. It's not like practice where there are turns and the balls comes to you. Instead in the game fielding requires paying attention and running to the ball - which is a very hard concept for a certain 4 year old to understand. They didn't have practice this week because it was rained out so we'll see how this game goes. I'm glad he's enjoying it though.... well when he gets the ball anyway ha! I'm a sucker for cute pajamas and I couldn't resist getting new Halloween ones for Micah and Alexis. However I feel bad I can't find any in Abby's size now that she has outgrown the little kid section. Seriously do 'big' kids not like cute pjs? Have you seen any halloween pjs in a 6 or 7? I'm debating taking the kids to another pumpkin patch with all the fun 'extras' this weekend. Them of course they'd know those extras were an option.... hmm.... They did love going last weekend. We'll see if we have time between tball and working in the Church nursery. 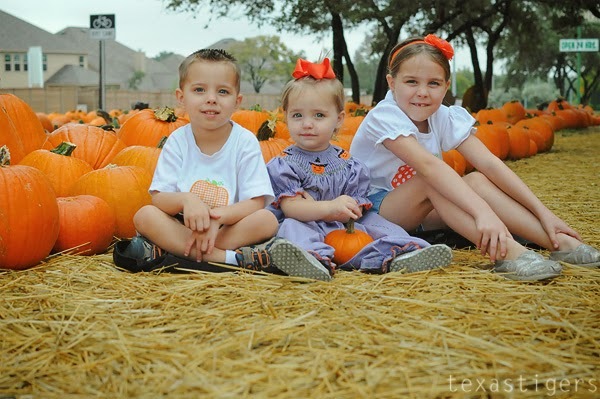 LOVE the pumpkin patch pics. so cute. and i am a sucker for smock dresses. adorable!!! Yay for your new phone!! And I hope you went back to the pumpkin patch! Sounds like SO much fun! Pictures please of the cutie new pjs!